Did you ever find something really interesting on Facebook but couldn’t watch or read since you had to rush somewhere? Facebook might just be working to find a solution for your problem. Reports suggest they are experimenting a new feature named “Save for Later”, similar to that of Pocket and Instapaper. “Save for Later” will allow you save the stories in a section being called “Saved”, which you can re-visit anytime later you wish to, to read the saved conent. People use Facebook to share a lot of stories not only through links from other websites, but also the information people share through the status updates on their personal profiles, groups and brand pages. As of now, browsing through anyone’s Timeline (be it your own or someone else’s) is a very tedious task. People share insane amount of stories in various formats like Photos, Videos, Plain Text, Milestones, etc., and it is pain in the neck to browse through them to find one single post, which was perhaps posted only a few days ago. No doubt the users will gladly welcome such a feature. A good thing for Facebook is their users will stick around the site longer, which is of course the reason why they would be introducing this feature. Applications like Pocket and Instapaper have seen a lot of popularity. Pocket, for instance, boasts more than 9 million users and 240 millions saves. A technology blog, MyTechSkool first noticed this new feature which they reported to AllThingsD. Here’s how the feature works. A small bookmark icon, similar to the one found in iBooks, is visible on the right side, beside the post. 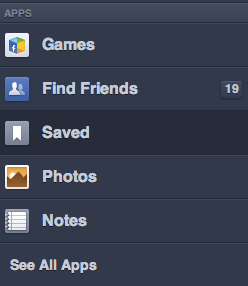 And once clicked on it, the post is saved to the “Saved” section which falls under the Apps menu. Inside the list, left swipe on the post reveals two options; Share and Remove. Please note that Facebook is yet to announce anything related to this mater, or even give an official comment on it. Note quite long ago, WSJ had reported that Facebook is building a new Flipboard style magazine app called Reader. There hasn’t been news regarding that either. However, looking at the images above, one can say that although the Magazine app looks like a mere idea for now, the “Save for Later” feature might actually be for real and may even start rolling in a matter of time. We will update this post once we have more details on it.